CESS IN SPITE OF WEATHER. THE SHRINERS' PARADE PASSING THROUGH THE BUSINESS DISTRICT. Three sharp blasts on three shiny bugles, blown by three nattily clad circus women, astride three snow white horses, and the Shriners' monster parade began its course from Convention hall promptly at 2:20 o'clock yesterday afternoon. It had begun to rain, but that made no difference to the Shriners. 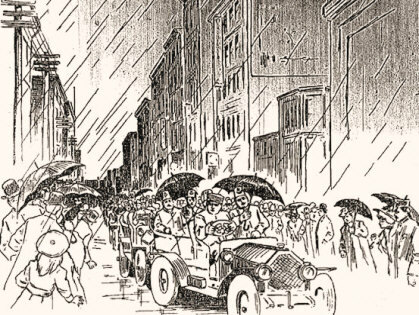 Circus parades always had to happen, "rain or shine," and the nobles clambered into the many automobiles waiting for them and started out to show what might be expected from the Rhoda Royal Indoor circus, which will be given in Convention hall all this week. First in the line of parade rode members of the mounted squad from the Kansas City police department, followed immediately by Wheeler's band. Then came the notable Shrine patrol, every member of which was dressed in his bright Zouave uniform. Following the guard of the patrol rode the grand marshal of the occasion, Noble J. H. Knapp, in saddle for the first time in twenty-six years. The high nabobs or illustrious potentates, past and present, were placed up close to the head of the procession, also garbed magnificently in their mani-colored robes and turbans. They followed the grand marshal. Then came the city officials, the mayor and members of the council. Then, high up on tally-hos, rode the Daughters of Isis, the woman's auxiliary of the Shrine. The rain didn't hurt them other than taking the curl out of the carefully trained locks of hair. The general body of the Shrine nobles had planned to walk, but the rain made that too uncomfortable and automobiles were hastily gathered for them, and the several hundred nobles rode behind the tally-hos and the Daughters of Isis. But the camel, he must not be forgotten, and it was a real live camel, too, with two real, ugly humps on his back. He, led by his daring keepers, Nobles Brown and Hartman, shuffled along the slippery pavements between the divan and the body of the nobles. But the order of the parade has not been finished. After the body of nobles came the Wild West bunch, augmented in numbers by the boys from the stock yards. the saddles and horses had the appearance of the wild and woolly West, and the crowds on the street knew n o better. then rode the feminine contingent of the circus, some of them driving tandem. Yes, the clowns were there, two of them, in fact, mounted upon jackasses. That's what made the circus parade real. Sandwiched in between the two clowns was a wagonload of prospective initiates to the shrine, masked and hideously decorated. The wagon which held them bore the legend: "We are going to cross the hot, hot sand," but nothing was said of the cold, wet, asphalt pavements. Two or three more bands and another Wild West and stock yards contingent brought up the rear of the parade. Crowds of people lined the sidewalks and streets watching the parade. The route was a convenient one, calculated to give every one a chance to see the procession twice, at least. The automobiles at times didn't behave like well-bred automobiles should. At the Petticoat lane turn they insisted upon skidding into the crowds which had lined the streets. The drivers couldn't help it. Neither could Sergeant James Hogan of the traffic squad, although no one was injured. It was not infrequent that something went wrong with one of the numerous machines, and that blocked the parade. Two or three of the machines had to be pushed out of the path of the parade. Petticoat Lane is the hottest place in town. Petticoat Lane is one block in length, running east and west, between Main and Walnut streets -- or, more plainly put it is the main thoroughfare between several of the large department stores of the retail downtown Kansas City. At 4:45 o'clock yesterday afternoon the mercury registered 106 at the northeast corner of Eleventh and Walnut streets. This intense heat was general in Petticoat Lane. Just around the corner in Walnut street at Eleventh, on the west side of the street, it was a trifle over 3 degrees cooler. "The sun's rays beat down on Petticoat lane all day long. The pavement is smooth and reflects the heat. Then the summer southwest breeze picks up the heat and hurls it against the buildings on the east side of the street. That accounts for the cooler temperature on the west side of Walnut street, just off Eleventh street." And while the sun's rays beat down upon the pavement in Eleventh street, better known as Petticoat Lane, thousands of shoppers walked and rewalked through the block all the long, hot afternoon. The women carried fans and liberally patronized the soda fountains which are located alluringly near the open doors of the drug stores -- and all thought yesterday was the hottest day ever.